Since watching the beautiful and moving timelapse video put together with images from the International Space Station, I’ve become curious about everything Space Station! There are a number of different resources I’ve been using to find out about life on board the Space Station and also the support that it requires to function. 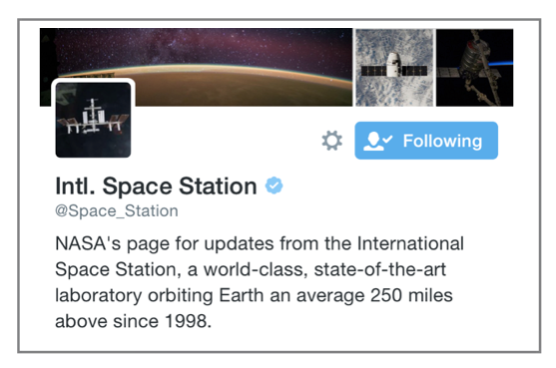 @Space_Station This is the Space Station’s Twitter account and my main source of info for all things Space Station. This account also retweets tweets from the astronauts on board so it’s a great place to start finding out about who is up there, what it looks like and the sorts of experiments and work they are doing right now. NASA Space Station website Lots of info here on what’s going on “Off the Earth, For the Earth” including links to ‘Space Station for Students’ where you can take part in experiments and look at cool resources from the Space Station, and the related ‘Space Station for Educators’. The European Space Agency has information on the International Space Station and the parts of the Space Station that the ESA has responsibility for. Where is the Space Station right now? This website shows you the point on the Earth that the Station is directly overhead, updated every second. The ISS Above is a device that lights up when the Space Station is above you. It uses a Raspberry Pi to work and can also send a Tweet when the Space Station is above you. Pretty cool for your classroom window! There are a few Apps that tell you when the ISS is going to be overhead. GoISSWatch and ISS Spotter are nice. 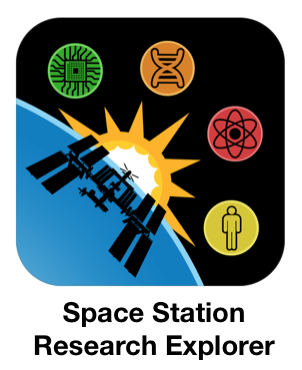 ISS Spotter will also set an alarm on your device to tell you when the Space Station is passing nearby. Space Station Research Explorer tells you all about the experiments that are going on onboard the International Space Station with lots of photos, videos, interactive media and in-depth descriptions. There are so many resources out there to satisfy – and further! – your curiosity about the International Space Station. It’s been a real journey of learning and discovery finding out just some of the things that are happening onboard and also to find out about the people on board the station. It’s wonderful that technology allows us to be this close to things that are so incredibly far away! If you have a favourite resource feel free to list it in the comments below.